Between early February and early April 2015, the Russian ruble gained 22.3 percent against key benchmarks, making it the world's best-performing currency. 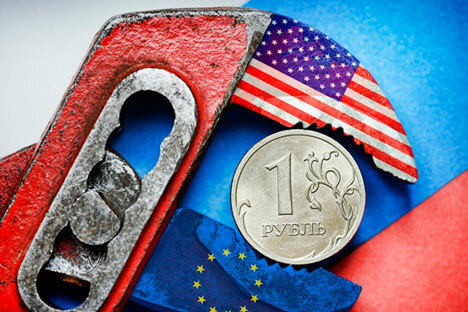 Experts are not yet convinced that this impressive strengthening of the ruble will become a long-term trend: in December 2014, the Russian currency lost about half of its value against the US dollar and the euro. Between early February and early April 2015, the Russian ruble gained 22.3 percent, making it the world's best-performing currency, UFS IC chief analyst Alexei Kozlov has told RIR. The gains made by the Russian currency were higher than a rise in world oil prices, a trend the ruble usually closely follows. In the same period, the price of Brent crude oil grew by just 9.8 percent, from $53 to $58.2. According to Kozlov, the ruble bounce can be largely attributed to investors' interest in the high yields accumulated by developing markets. The gains come after the Russian currency lost about half its value against the US dollar and the euro in December 2014. Konstantin Korishchenko, deputy head of the Stock Market and Financial Engineering Department at the Russian Presidential Academy of National Economy and Public Administration, which strongly influences Russian government fiscal policy, told RIR that a combination of several favourable factors in past weeks had influenced the ruble rally. Korishchenko said a decision by the Russian Central Bank to grant $30 billion worth of foreign-currency loans to banks and to cut the key interest rate from 17 to 14 percent were key factors, along with lower tensions in eastern Ukraine. "All this has made investment in the ruble and ruble assets speculatively more attractive," said Korishchenko. Anton Soroko, an analyst with Finam Investment, says the Russian currency may soon strengthen even further if oil prices rise and there are clear signs that sanctions against Russia may be lifted. Among the positive factors he listed agreements with individual EU countries, including promises of Russian investment made during talks between Greek Prime Minister Alexis Tsipras and Russian President Vladimir Putin in Moscow on April 8. "The overall situation in Ukraine at the moment looks stable, so there seem to be no grounds for the EU and the USA to toughen their rhetoric," Soroko added. UFC IC's Kozlov agrees that credit for the strengthening ruble belongs with the Central Bank, which has developed a monetary policy that has significantly curbed its volatility. At the same time, he adds, despite the gains made by the ruble, there has so far been no increase in investors' interest in the Russian economy. Experts are not yet convinced that the sharp increase in the value of the ruble will become a long-term trend. "Claims that the value of the ruble is no longer pegged to oil prices are not quite appropriate. Rather, one could speak of a different level of ruble/oil prices for 2015," Korishchenko, who is a former deputy chairman of the Russian Central Bank, said. He added that the direction in which international oil prices were headed was unclear: the nuclear deal with Iran was sending a positive signal, while the conflict in Yemen, was a negative influence. Russia's economy remains saddled with fundamental problems, the experts say. "The shortage of capital experienced by banks; the lack of economic growth; the continued trend towards an increasing role of the state sector in the economy – all these factors cannot but cause concern and restrain optimism for the future value of the national currency," Korishchenko said. If oil prices see no growth and capital flight from Russia remains at the same high levels, the ruble's prospects for 2016 will be considerably bleaker than for 2015, he added. The overall picture for the ruble looks much better than it did several months ago, but for this positive trend to continue, the government should create incentives for market-economy mechanisms instead of hoping for a rise in oil prices, the former deputy chairman of the Central Bank concluded.